A rather niche product named Microsoft Test was released back in the early 1990s, with Version 3.0a being the last of it in 1994. Finding information about this piece of software is not easy these days, and you are more likely to find Microsoft Certification tests instead searching on Google. Basically it’s a development tool using TestBasic, a scripting language with similarities to Visual Basic. Offered mainly to software publishers, I actually hadn’t been aware of this product until the last year or so. The point of the software was to automate keystrokes and mouse clicks to validate the results as part of regression testing. Regression testing was a method so that when additional development was made, existing software functionality was working as it should without causing potentially new unexpected bugs. This becomes more important when developing more complex software to ensure a certain level of quality control. A developer would have this installed along side Visual Basic, Visual C++, or whatever their desired language had been. Windows 95 was the first to receive PowerToys, a collection of free tools created by some of the developers at Microsoft though was officially unsupported and testing wasn’t as thorough. In its day many users had the opinion that what PowerToys had brought should have been in Windows 95 to begin with. At just 205 KB in size to download, over a dozen enhancements were included with various levels of usefulness. To install it’s just a matter of extracting all the files into an empty directory (folder), and running install.inf by right-clicking the file and choosing Install so it doesn’t use the default option to open in Notepad. Today I picked up in the mail a shrink-wrapped copy of Mastering Microsoft Visual Basic 4.0 made by Microsoft Press. Being a Microsoft Press title and not seen one closely I was expecting more printed material, though instead the contents was no different from picking up an early multimedia software title (i.e. very little in the box). A book I bought on eBay cheaply, this was Microsoft’s official technical guide for IT professionals concerning Windows 3.1. Unfortunately the original disk was not included, but nevertheless is in really good condition for a soft cover. For those who haven’t browsed a copy, at over 500 pages this book contains plenty of reference material that is not documented with your traditional user guides or help files. It gets into the nitty gritty of how the operating system works, and how it can be manipulated. An example would be how to create a customised setup installer with your own device drivers and remove non-critical files to create a lean Windows installation. 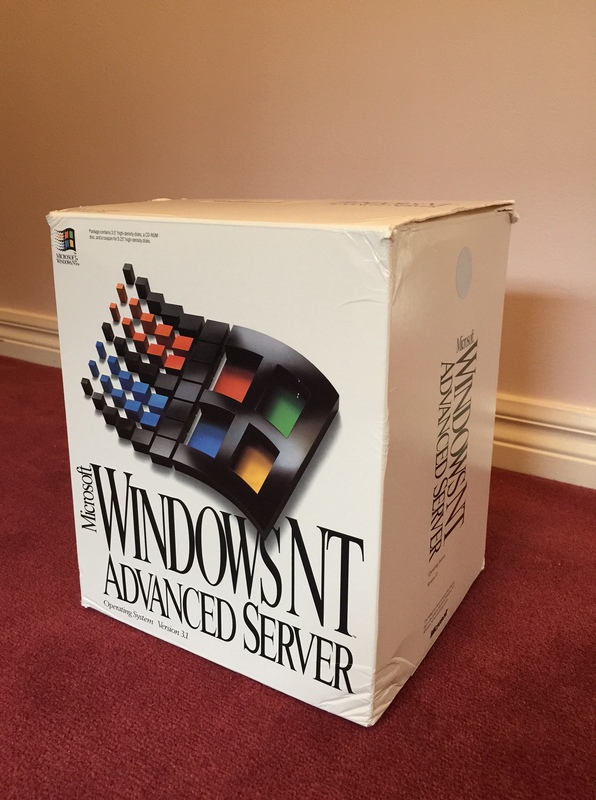 An eBay find from about two years ago, finding copies of Windows NT 3.1 is generally difficult, so I was pleased to grab a copy admittedly paying more than I would have hoped. Unfortunately falling over in a cupboard the box hasn’t fared as well, though for the most part is in good condition.